Warehousing |Licensing | Management | Piraeus International, Inc. Successful warehousing is about management and technique. You can only gain the proper technique by experience. We here at Piraeus International, Inc. have gained 40 years of experience by loading containers going to every part of the world as we know it. The pictures you are currently seeing are of loads that are not unique, but part of our requirement to take pictures of every load, every shipment, every container we export or import. We feel that the moment you can see that your goods are on their way, and in the container, that you will begin to rest easier about your items. On a more professional note, it should be the norm, that companies do that for their customers. We do it to secure our customers faith in what we believe, safe carriage. At the same time, it is important for us to document these types of pictures to show you what to expect when you open your container abroad. Our policy has always been one of ' No excuses'. We make sure that we use the right carriers, who maintain the right container equipment that do not leak, or expose your items to unecessary natural threats, like rain, snow, cold or hot weather. Thats the experience that shows, when we know how to plan for your cargo receipt, before we even load your shipment. On few occasions, we may even defer your shipment, as it may not be safe to handle, or provide loading for, as we want you to know that we are not comfortable with handling it, and the reasons why we chose this option. Our warehouse is equipped to handle any type of cargo, but there are times when it is critical to make sure you know why cargo cannot be handled in standard type of containers. So lets move to the more advance shippers, who want to ship more than 2 automobiles, like three and four automobiles in a 40ft. container. We can do that as well, but we do make sure you know that two automobiles in a 40ft. container are the norm of the shipping world, and the accepted safe practice. In fact, its the only insurable scenerio that Ocean Marine Insurance Companies will accept. So, our experience, takes you through the maze of problems you will encounter when exporting or importing your goods. So, if experience and technique are not enough, well lets talk about our resources. Our facilities allow us to keep your items in our facility at no extra charge, while you assemble your orders for export. On the import side, we offer the same service. 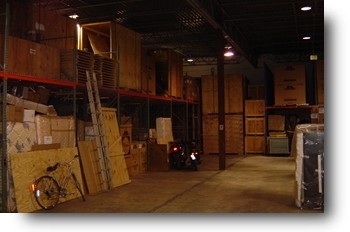 In fact we have accomodated some long term storage concerns for anyone commiting to an export shipment. Its a unique offer, that have been offering our consumers for over three decades. We want to encourage you, the shipper, to purchase whatever it is you want from the US, and export them abroad. In fact over the last four dedaces, we know who to refer you to for mostly anything you are purchasing, virtually anything from construction equipment, furniture, household items, appliances, automobiles, and yes even boats. Our strength is in our preparation, and ease of doing business. This is one of the most critical underated areas for companies, LICENSING. When companies are 'FEDERALLY' licensed for what they are doing, not just registered locally, it shows that they have passed the tests, and the experience, as well as have the background requirements, to handle shipments on behalf of others. The company must also be Bonded by an insurance carrier to guarantee the License to the US Government. This protects you and holds the company accountable for their actions. When dealing with just a facility, or even just a loader, you are risking everything you own, the money you pay for freight, and the actual receiving of the container under the conditions you are expecting it to arrive at its destination. So, we walk you through the right way to export your shipment, and make sure you know the entire process. If you are not confused already, lets make it clearer, you are the shipper, and as the shipper, all of the documentation points to you. Whether or not you warrant an express release or Original Bill of ladings, it needs to be done in a timely fashion. Our documents are filed in accordance with all of the cut-off procedures, 72 hour rules, as well as vessel carrier requirements. Now, lets talk about the warehousing aspect of licensing, and that is the consistency of the way we manage our facilities. We manage them with the strictest of guidelines. Our warehouse is also a US Customs Bonded Warehouse, and that means, we make sure that it is in the best condition, kept neat and orderly to insure your goods are safe and accounted for. Remember if the warehouse is not organized, and kept in an orderly fashion, what do you think happens to your items you are shipping? You answered it, and it's not a good scenerio when your goods go into a storage, or warehouse area, that is not supervised and managed every single day. Our facilities are managed, supervised, and the upkeep is performed every single day. We are our own worst critics when it comes to warehouse maintenance and upkeep procedures and guidelines. We are even harder on ourselves when handling your cargo.